I know how busy everyone is in the remodeling industry so I decided to pull together some often-shared remodeling articles all in one place for your convenience. These remodeling articles are listed in rank order by how many social shares they each received when I last pulled them. 1. 30 Small Bathroom Remodeling Ideas and Home Staging Tips — Lush Home - This article is full of great photos and provides some really useful ideas for making a small bathroom remodeling project look epic! 2. 2015 Remodeling Cost vs. Value: Less Is More — Realtor Mag — This article focuses on which types of remodeling projects have the biggest return on investment when selling your home. As most of you know, remodeling the kitchen still provides the biggest bang for the buck and more specifically, the minor kitchen remodel job with a national average cost of $19,226 has an average payback of 79.3%. 3. 2015 Preview: Bathroom and Kitchen Remodeling Trends — MSN — This article consists of an image slider and short explanations of each trend which makes it fast and easy to read. A few of the highlights from this article are: Bathroom budgets are going up, more people are going with custom cabinets, and stainless steel and granite still rule the kitchen. This article also points out that spending on remodeling is going up with 23% of remodeling contractors reporting that the gross on their remodeling jobs in 2014 were up between $5,000 - $10,000 over 2013. 4. Row House Kitchen Remodel — Wentworth Studio — This post is simply an image gallery of a kitchen remodel project in Glover Park, Northwest Washington, DC, which explains why a majority of the shares were on Pinterest. It may be time for you to start thinking about using Pinterest as part of your digital marketing strategy especially when you see the shares and traffic you can generate like some of these posts did. 5. 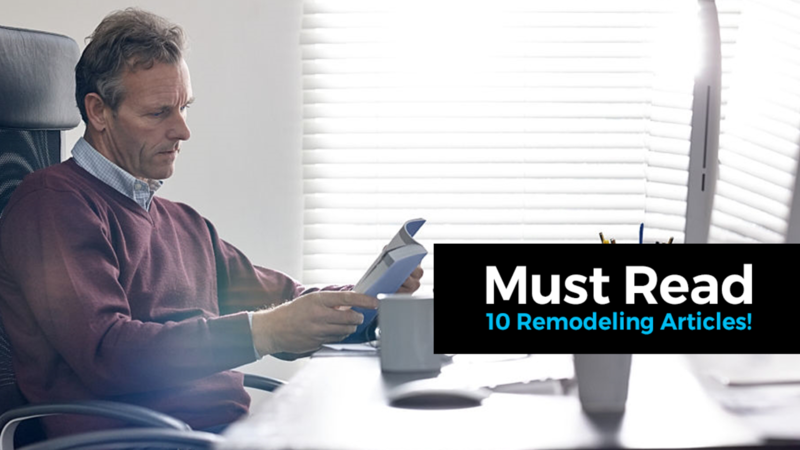 The Newest Remodeling Trends You’ll Want to Try — Better Homes and Gardens — This article has a broad focus and includes ideas for interior design, technology and more traditional remodeling topics such as what’s hot in basement remodeling, attic getaways, and home automation. 6. Ask a Designer: How Much Will It Really Cost to Remodel My House? — House Beautiful —This article is part one of a two-part series and covers how to get to the true cost of remodeling from the interior design component. In part two of the series the author covers how to determine the true costs of a remodeling job from the construction side of the job. 7. More Home Owners Are Remodeling Again — Realtor Mag — Referring to the National Association of Home Builders’ Remodeling Market Index, the remodeling market reached a record-high in the final quarter of 2014. Good news! 8. 12 Remodeling Sanity Savers — Houzz — This post includes some great ideas for minimizing the stress that can come from building or remodeling a home. These ideas would be beneficial for both the homeowner and the contractor. 9. Smaller Remodeling Jobs Get Better ROI — Realtor Mag —This is another article talking about the ROI of remodeling projects from the homeowner’s point of view. This article includes links to a couple of good resources on the topic. 10. Remodeling 101: Wall-Panel Radiators — Remodleista — It’s almost hard to believe that an article about wall-panel radiators made it into the top ten until you see the photos. I had no idea how cool wall-panel radiators could look and after reading this post, I’m thinking I may want one in my home. I hope you find these articles informative, useful and/or entertaining. If you do, feel free to share this post on your favorite social media channels!